> McAfee > Advanced evasion techniques in depth. Know what the threat is and how to stop it. The network security paradigm is currently shifting toward a new reality as advanced hacking methods become more prevalent and harder to detect. 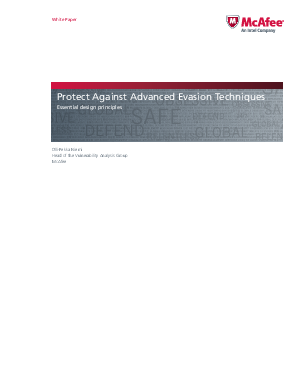 An example of such a method is advanced evasion techniques (AETs). Although evasions have been documented extensively in the last fifteen years, security vendors have systematically ignored the significance of evasions. Some vendors have even downplayed the threat posed by evasions as being purely theoretical. Yet this debate misses the bigger issue: the risk of network security systems being compromised by AETs continues to grow as more and more cybercriminals actively exploit this vulnerability. The answer is to combine stream-based inspection with data normalization on multiple protocol layers.